Hubbing Process - What is a Coin Hub? 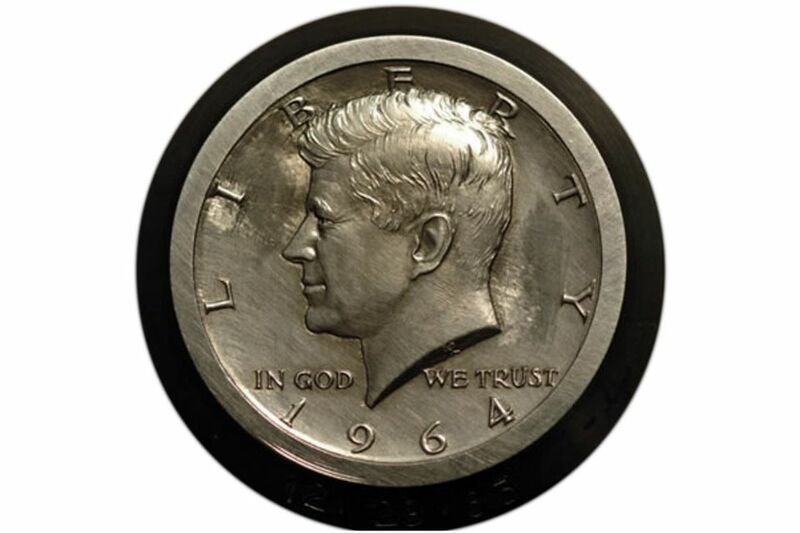 Original Hub for the 1964 Kennedy Half-Dollar. A hub is a positive, or relief (raised) image of the coin's design that has been impressed into a steel shaft during the process of creating the tools that are required for making coins. The original coin image is actually a plaster sculpture about 8 to 12 inches in diameter, from which a Master Hub is created using a special process that reduces the image to the actual size of the coin. This Master Hub, which bears a relief image of the coin design, is then copied on to a number of Master Dies (which bear the negative, incuse or sunken image of the coin). The Master Dies are then copied, using a special extremely high-pressure "squeezing" process which employs tremendous hydraulic force, to create the numerous Working Hubs (commonly called simply hubs.) Then, from the hundreds of Working Hubs, the mint creates the Working Dies, (commonly just called dies.) It is from these working dies that our coins are actually struck. The coin image on the hub is always a positive, or relief image, and the image on a die is always a negative or sunken image. In this way, when our coins are struck, we get the raised detail we expect on our circulating coinage. The coin hub itself looks just like a coin die, with the exception of the relief image. It is comprised of a steel shaft with the image of the coin impressed into one end of it. Some coin dies are specially manufactured to be used in the production of collector coins. For example, Proof coins are minted from specially prepared coin dies that have been polished to a mirror-like finish. Other parts of the die are finished with a process to impart a frosted finish to select parts of the die. Currently, The United States Mint uses computers and digital imaging to create our coins. Some of the artists at the mint use computer software to sculpt the coin images. Other artists sculpt directly into traditional plaster media. Regardless of the media chosen, both methodologies result in high quality dies used by the United States Mint. If a coin design is created in plaster, it is then three-dimensionally scanned into the computer. The computer image is then manually touched up before the master hubs are created. Imperfections are removed, letters are aligned, and the design is reviewed to make sure it can be physically produced on the coining presses that the mint uses. The master hubs are created using a computer controlled CNC milling machine to sculpt the design directly onto a steel shank. The steel shank is now known as a master hub. The master hub is then put through a special process that hardens the steel so master dies can be made. The process then continues as it previously did before the days of computer-aided manufacturing. Gone are the days that manual processes that were once used to create master hubs from plaster models. Computers and software now help the United States Mint to produce the highest quality coins that the world has ever seen. Although the addition of computers into the design and manufacturing process at The United States Mint has greatly reduced the number of mint errors and die varieties, the possibility always exists. For example, the 1992 Lincoln penny used two different hubs to create the dies. On the reverse die of one hub the distance between the "A" and the "M" in the word AMERICA is different. A coin die that was specifically made to produce proof Lincoln cents was actually used to produce circulating Lincoln pennies. The distance between the "A" and the "M" in AMERICA is closer together. Since so few of these coins were made, the close AM variety of the 1992 Lincoln penny it is extremely valuable. Even with today's high tech equipment that is used to produce hubs and dies, the possibility for errors and varieties always exists. Remember, all the machinery in the world cannot overcome a mistake made by a human. Numismatists and collectors who constantly inspect coins looking for errors will eventually find a mistake made by the United States Mint.